Oh my, what a fantastic trip! 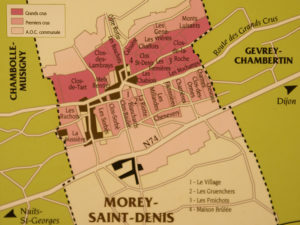 I enjoyed your tour of Morey St Denis, and I was especially excited by your mustard adventures – Maille is a fave, Moutarde au Poivre we like in my house. Fun read! I posted it on the Facebook pages of both wineLIFE and Women for WineSense NYC Chapter. The wineLIFE posting also shows up in my Twitter feed, so I hope these get you some more traffic.